Hi Mei fans from Overwatch,I’m a Mei fan and main and wanted to share you something.It’s my fan skin for Mei: Marine Biologist MeiFor the Overwatch SEA Fan Art Skin contest.About my concept: My Mei’s Marine Biologist skin is based on many marine biologists wear: a lab coat and a swimsuit. Her weapon designs have wave elements that resembles beach sea waves. Her drone, Snowball, resembles a clownfish design. Take a look: Main skin design: Alt skin design (no coat, blue swimsuit only): Weapons design: This is also my contest entry for the official Overwatch SEA Fan Art Skin design. What do you think? I modeled her design after her KH3 appearance, with many more "combat-orientated" details that other artists include in their designs as well. For her dress, I made it a tad bit longer, and incorporated the small studs that where on her KH2 dress, and X marks on her dress when she was a child. For her belt, I kept the same consistency with Sora and Riku having Yen Sid inspired buckles, and I included the bag she wore in KH2. 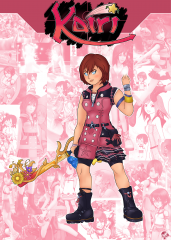 Under her dress, I included shorts and the sports bra she wore in KH1. I also include her bands and bracelets from KH1, 2 and 3, with some light magic ready to cast! For her boots, I included the straps from KH1, in the updated color scheme, a single black tie around her leg as a reference to her KH2 shoes. For her Title Logo, I kept with the similar style of Sora and Riku's. I included the Paopu Fruit as a shooting start image, to make the two dots for her "i"s. In the background, I made a negative space of her symbol seen in the Ultimania Guide as a small nod. 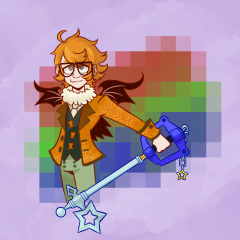 Art for my Kingdom Hearts AU, but I think it'll be good here! 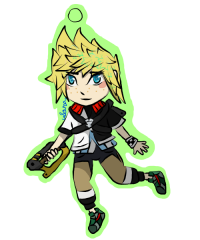 The original KH1 Sora is my favorite Sora of all time. <333 I love drawing him a lot! I started this last month and finished earlier this month. © uhh not sure what exactly we put here but I guess uh, me/SUEÑO DIVERTIDO. Heartless Cards - Enter the Gungeon SHADLET: When the Gundead falls into darkness, the shadows take over. The Shadlet is a small Bullet Kin designed to be extremely similiar to the base Bullet Kin seen in Enter the Gungeon, with heavy inspirations from the Shadow Heartless. The name is simply a combination of Shadow and Bullet. AMMO ANTHEM: Sing the song of Guns reloading! The Ammo Anthem is the Darkness in a Gun Conjurer, designed after the musical themed magic Heartless with implementations of the Conjurer's robes. The name comes from Ammunition and Anthem. FRAGGER: The Fragger is an explosive Heartless that has one goal: To blow up. It is designed after grenades of course. taking ques from the Pinhead Gundead and the Minute Bomb Heartless.. The name comes from the nick name for Fragmentation Grenades, or Frags. GUN CALIBUR: The Gun Calibur is a fusion of the Gun Nut Gundead and the Armored Knight Heartless. The name is a double pun: The calibur of bullet and the famous Excalibur sword! TANKYU: The Tankyu is a more custom Heartless, with inspiration from the Hot Rod type. Designed after a Tank, this small bit of Darkness packs a powerful punch! The name is a bastardization of "Thank you". MAD GUN AND THE CHAMBERED: The custom Heartless boss, the Mad Gun and the Chambered! This dual Heartless is deisgned to be a weapon wielded by the High Dragun. Shooting out the Chambered as bullets to hit their targets! The Chambered are then designed to return to the Gun! Also, the Mad Gun is can fire without a wielder! Once the Dragun is defeated, you still have to contend with the trigger happy Mad Gun!! That is it for the Enter the Gungeon Heartless! This is a bit new to me, so please let me know if you want to see more! And Stay Tuned for the next one! 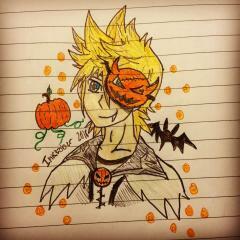 The second inktober sketch I did last year, featuring Roxas in a Halloween Town style outfit. Second set of Kingdom Hearts Mobs! 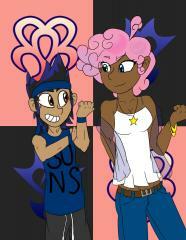 This time around, I drew the brother and sister duo of Flood and his big sister Spirit! Although the Dream Eaters were featured in 3DS and the Unversed have been around since BBS, I have a theory that the Unversed are actually a mutation upon the Dream Eaters themselves who take physical form through Vantius. This isn't supported by a lot of sound evidence, but I figured it would be a nice theory regardless. 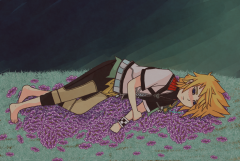 Either way, Dream Eaters have been around longer in the Kingdom Hearts world than the Unversed. I believe that the Dream Eaters would be an entity that has always been around a lot like the pure-blood heartless that exist in the world of KH. I believe I have one more final picture to draw featuring the evil versions of all four of the Mobs. Keep an eye out for it in the coming month! The second sketch I did for 15th Anniversary, and for attending the Orchestra last Friday, it was just amazing!!! 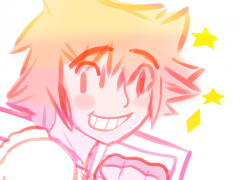 One of two sketches I did of Sora, on Tuesday, planning to draw my KH content this year! I have started work on my "Road to 2.8" November piece. Decided that this one was going to be themed around Back Cover. I was super excited about drawing the foretellers as I love their character designs. This is just a work in progress sketch for now. Just wanted to give you guys a little sneak peek! Let me know what you all think! So, I haven't really been too active on here (due to school among other things), but I really want to change that. 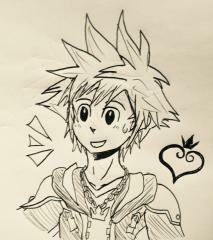 Kingdom Hearts is a big part of my life. It is a main source for why I decided to go into the field of study I chose (Animation). But anyhow, to start off becoming more active in the community, I thought I would share a sketch I worked on today and plan to continue working on later. To occupy my free time until 2.8 comes out, I thought I might work on some character drawings of some of the main characters from the 3 parts of 2.8 (Aqua, Sora/Riku, the foretellers). 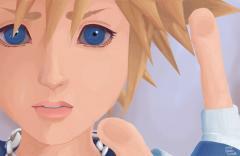 My fan made version of an avatar from kingdom hearts chi. Aww... she looks so cute! It looks like she could've come from destiny islands. Yes, you may use picture in videos, wallpapers, signatures, and avatars. For anyone who wishes to use this drawing just please be sure to credit me before using it if possible. The kh13 official social media staff is always free to repost any of my drawings! The same picture as last time, just hopefully a little less blurry. Well, it's taken a while to finally upload it, but here it is! I'm hoping to start posting more fan art on here every once in a while. I've still got a few more drawings to upload so I'll have more drawings coming soon! Hello. I did more crappy art. Take a look. Ghost Hunt and other original stuff. Too much Homestuck. Other crap: The end. Critiques and stuff would be appreciated, but if you wanna go home, that's an option too. Hi all! I'm not sure if there's anything in the rules against posting this here, I couldn't find anything in regards to the rules in that regard, so hopefully I'm not breaking any rules or anything. Anyway, I'm looking for someone to do art for my YouTube/Twitch channels. I'm a very small time youtuber, nothing big or anything, but my channels DESPERATELY need art. I did go to Deviantart originally and I had found someone, however, they haven't gotten back to me and they made several mistakes in terms of what I wanted so yeah, I thought it was time to find someone else. 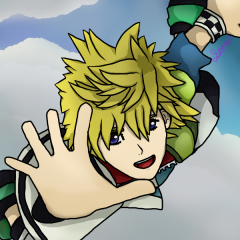 So I thought I would come here since one of the big things I'm looking for Kingdom Hearts/Disney inspired artwork for the channel. In terms of what I need, well I guess to put it simply, I need everything, lol! I need an avatar, I need banner art, you name it, I probably need it. So if anyone out there is interested, please reply or PM me with your prices and some samples of your work. And please, please, PLEASE, let me know how often you are able to communicate frequently or not. I don't want to wait another 7 months (no, I'm not kidding, that's how long the other artist kept me waiting and replies had started getting few and far between the longer it went on) for the art. I understand all too well that stuff in real life comes first, but I would rather be told something will be delayed than be left hanging in the dark and wondering if you vanished, lol. So if anyone out there is interested, please feel free to reply or PM. I look forward to seeing everyone's work.